“I’m only one person, how can I possibly make a difference?” This is the question we’ve investigated all month long here on Artist Strong. Hi, my name is Carrie and I help artists like you refine your skill and develop your unique artist voice. Today, I’m going to walk through specific steps you can take today to connect your art to a project of activism that is important to you. You will need a notepad and paper, or you can sign up to download the fillable PDF I use in today’s video just below this video on the blog. First off: What social causes do you care about? List as many causes that matter to you. They can be as big and as small or specific as you like. For example, you may want to help improve the quality of drinking water for people around the world. Or, you may have a loved one who needs funds to help them pay for college. List everything that matters to you. Be honest here: list the causes that you feel personally connected to: you will have greater success in your activism efforts if your passion is aligned with your cause. Now, choose one for the purpose of this exercise. If you change your mind and wish to apply these strategies to a different cause, you can go through this mini workshop all over again with the new cause in mind. What organizations (local and international) exist for this cause? Does it feel good to align with any of these? If working locally is important to you keep your search for businesses/non-profits or other organizations who may also want to get involved or partner with you. You may also believe in larger organizations and wish to contribute to their work: list them all! Once you have a list to reference (think of how many times you could do this project?!) choose one. What are 3 projects you could develop and think through to apply to working with the organization? Choose the one that excites you the most. The project itself is valuable, but you are going to have to “sell” the idea to the organizations you think about partnering with, which means you need to have clear objectives and benefits. List the objectives or goals you have for the project and create a list of the many benefits you see coming from this project. Write a 3-6 sentence paragraph describing the project and your goals for it. You have a list of objectives and benefits. Now it’s time to put it together in a concise, easy to read pitch. Reference your list and write 3-6 sentences describing the project. You will be using this to email or even better, speak about, when you phone the organization to propose your activity. You may also want to add below the above paragraph a list of resources you will be using for the project and offer a timeline chronology of the proposed activity. Make a list: what resources do you need? Create a timeline: what will the timeline look like? How will you wrap up this project? Not only do you need clear benefits and objectives for your project, you will want to have either a culminating activity or some kind of public wrap up event to conclude your project. A reception, a press release, a Facebook Live where you talk about the project and it’s success… you decide but this will be good to think about and include in your description of the project as appropriate. Who do you need to connect with in the organization to get the ball rolling? You may have NO clue who you need to contact in the organization to begin your partnership. This is where you are doing to need a little grit. You can start by calling a main receptionist and ask them who you might speak with about a charity fundraiser you wish to facilitate in the organization’s name. A lot of people are nervous to make phone calls, but they are more powerful connectors than email. If you start with email, and receive no reply, follow up the next week with a polite phone call reiterating your desire to speak with someone in the organization that helps with community outreach/fundraising activities, etc. There may also be NO one in the organization that fits this description. So, who else can you approach with your idea? List names/email addresses/contact details of 3 people who might help direct you the right way. Where are 3 places you can promote or share this idea with others? Social media, reaching out to local press, and asking friends and family to spread the word are all good ideas. List 3 specific places and actions (remember I said specific) you can take to help spread the good word about your project. I’ve listed three additional resources below this video today to help you conduct your own research on the relationship between art and activism. Be Creatively Courageous: I WOULD LOVE to see what you come up with if this mini workshop has inspired you to action. Share your 3-6 sentence description of your project in the comments below! 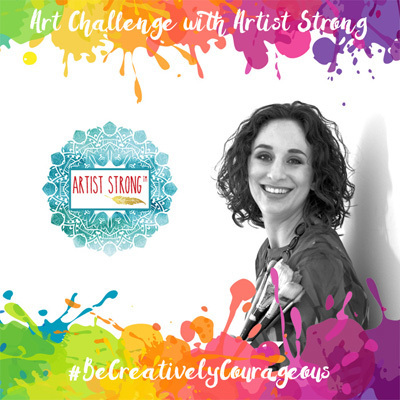 #BeCreativelyCourageous is also a free challenge that starts in just one week! Coming in the month of October it’s a 30 days about dreaming big, setting goals, and finding the path to your personal definition of artistic success. If you are an art activist who needs structure to build your work, or an artist looking to find your unique style and voice, this challenge is for you. Sign up below this video today to be sure you don’t miss out! If you are catching this video at a later date, sign up below to be notified of the next time I run this challenge. This is really overwhelming to me. I just want to paintnot run around for a cause. So just paint! If this content doesn’t resonate with you, there are many paths to being a creative. This is for those who want activism to be part of their art. There are no rules to HOW you build your art life… only the ones you give yourself.